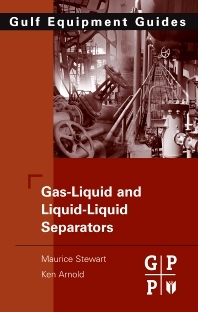 Gas-Liquid And Liquid-Liquid Separators is practical guide designed to help engineers and operators develop a ?feel? for selection, specification, operating parameters, and trouble-shooting separators; form an understanding of the uncertainties and assumptions inherent in operating the equipment. The goal is to help familiarize operators with the knowledge and tools required to understand design flaws and solve everyday operational problems for types of separators. Dr. Maurice Stewart, PE, a Registered Professional Engineer with over 40 years international consulting experience in project management; designing, selecting, specifying, installing, operating, optimizing, retrofitting and troubleshooting oil, water and gas handling, conditioning and processing facilities; designing plant piping and pipeline systems, heat exchangers, pressure vessels, process equipment, and pumping and compression systems; and leading hazards analysis reviews and risk assessments. Ken Arnold is a Senior Technical Advisor for WorleyParsons in Houston, TX. Spanning over 50 years of experience, he spent 16 years' in facilities engineering, project engineering and engineering management with Shell before forming Paragon Engineering Services in 1980. Arnold retired from Paragon in 2007 and formed K Arnold Consulting, Inc. In 2010, he joined WorleyParsons as part-time advisor while still managing the consulting firm. He participated in the initial development of several API safety related Recommended Practices including RP 75 and RP 14J and most recently was Chair of the National Academies Committee on Evaluating the Effectiveness of Offshore Safety and Environmental Management Systems. He has served on the Board of SPE as its first Director of Projects, Facilities and Construction and then later as VP Finance. He is currently Treasurer of The Academy of Medicine, Engineering and Science of Texas. Arnold has a BSCE degree from Cornell and MS degree from Tulane and has taught facilities engineering in the University of Houston Petroleum Engineering program and for several oil companies. He is a registered professional engineer and serves on the advisory board of the engineering schools of Tulane University, Cornell University and the Petroleum Engineering Advisory Board of the University of Houston. Recently, Ken received the 2013 Distinguished Achievement Award, considered one of the highest recognitions anyone can achieve in the offshore industry, at this year's Offshore Technology Conference in Houston, TX for his outstanding leadership and extensive contributions to the E&P industry. His many achievements include playing an integral role in the offshore industry's focus on safety through the development of Recommended Practices for offshore design and safety management, and he developed approaches to both equipment sizing and facility project management that are still in use today. He has also been instrumental in the effort to establish oilfield facilities engineering as a recognized technical engineering specialty.